A busy week for FC Barcelona concludes with their third La Liga contest in the space of eight days, when they take on Atletico Madrid at the Camp Nou (Sunday, 4:15pm CET). Having won 6-1 against Girona and been held to a 1-1 draw by Las Palmas, they take on their closest rivals in the Primera División table -who they lead by 5 points. Ahead of the vital game, coach Ernesto Valverde named an 18-man squad on Saturday, consisting of: Ter Stegen, Piqué, Rakitic, Sergio, A. Iniesta, Suárez, Messi, O. Dembélé, Cillessen, Coutinho, Paulinho, Paco Alcácer, Jordi Alba, Digne, S. Roberto, André Gomes, Umtiti and Vermaelen. Nelson Semedo has been ruled out through injury, and Denis Suárez, Aleix Vidal and Yerry Mina are left out for tactical reasons. The players trained on Saturday morning on the Tito Vilanova pitch at the Ciutat Esportiva Joan Gamper. 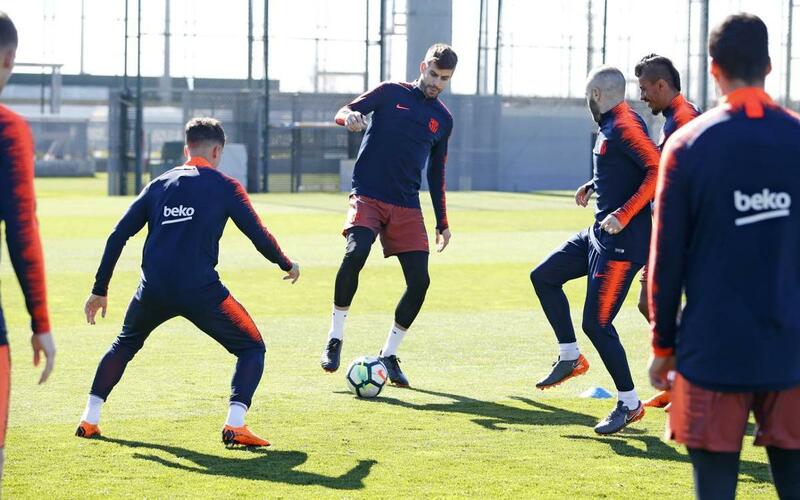 In their final session to prepare for the match against Atletico Madrid, Barça B Jokin Ezkieta trained alongside the first team players.